Medvedev has demanded that Russian law enforcement agencies coordinate their work in foiling terrorist activities instead of just acting as if they are working. The president reiterated that beefing up anti-terrorist security – first of all on transportation objects remains the chief task. Following January’s deadly blast at Domodedovo Airport, a number of shortcomings in security at transportation centers were brought to light and the president demanded that measures be taken to solve those problems. Speaking at a national coordinating meeting of top law enforcement chiefs on Monday, Medvedev stressed that Internal Affairs, Transport and Emergencies Ministries as well as other departments should join efforts in providing security in the sphere of transportation. Overall efforts should be coordinated by the Federal Security Agency (FSB), as the agency is responsible for anti-terrorist operations in general. Medvedev said that it is necessary to hold anti-terrorist exercises at large transportation centers in all Russian regions. He stressed that it must be done on a regular basis rather than “from time to time or right after tragic events”. The president also demanded that the Ministry of Internal Affairs raise the quality of work required of its employees, who responsible for transport security and if necessary, increase the number of such people by transferring them from other departments. Earlier this month, President Medvedev personally checked what was done for providing safety on transport after the suicide-bombing at Moscow’s international airport that killed 36 people and injured over a hundred. The president made an unexpected appearance at Moscow’s Kiev Railway Station to discover that there was not a single policeman at the entrance to the rail terminal and gateway metal detectors were not installed despite earlier orders to tighten security on all transport systems. The head of the Russian Railways (RZhD) was given three days to iron things out. While combating terrorism remains a priority, Medvedev outlined several other tasks for the Russian law enforcement agencies at Monday’s meeting. The president noted that “people are waiting for positive changes” referring to safeguarding public order. In this context, he said, fighting extremism should be given more attention. According to Medvedev, “in last five years the number of those convicted of fomenting national hatred and being members of extremist groups has increased by 2.5 times”. He noted that the majority involved in committing such crimes are people younger than 25. The problem of ethnic hatred and extremism has been high on the agenda lately, as the leadership is seeking ways to teach people of different ethnic groups to live peacefully with one other. Earlier this month, at a meeting of the State Council in Ufa in the republic of Bashkortostan, Medvedev called on authorities, religious representatives and public organizations to bring efforts together on finding new approaches in educating Russian citizens as schools are the place where the “basics of a person’s view of the world” are set. Among other priorities, the president stressed the need to achieve better results in fighting crime and gangs, and corruption. He underlined that a special “attention” should be paid to crime prevention committed by minors, as their number has grown by 1.5 times in the past six years. Homelessness and lack of behavioural control are the main reasons for that. 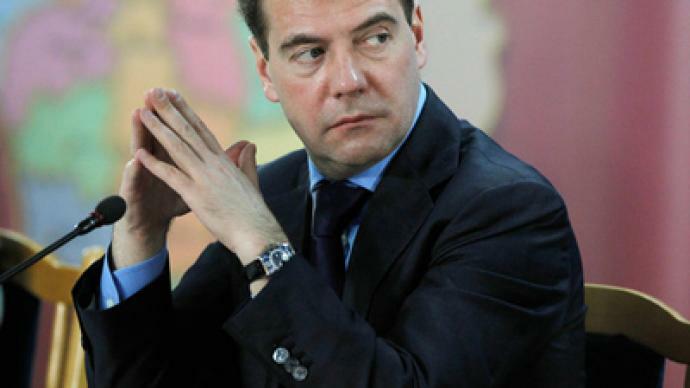 During the meeting, Medvedev touched upon a recent case of illegal gambling unfurled in the Moscow region. According to the Federal Security Service and the Investigative Committee, the agencies unearthed a network of gambling parlors operating in 15 cities throughout the region. They allegedly had enjoyed the support of some high-ranking officials from the regional prosecutor’s office and the Interior Ministry. “I would like to note one thing in this respect,” said the president. “I think all those present are perfectly aware of the fact that laws applies equally for everyone. And those who breach them must be held accountable irrespective of their posts,” he stressed. At the same time, he emphasized that "no one can make conclusions about their guilt or innocence ahead of the court’s decision or – even worse – influence the investigation through the mass media”. Medvedev ordered the Prosecutor General, Yury Chaika to present a report on Domodedovo’s owners, since current information on who the owners of Russia’s largest international airport are, has been unclear. 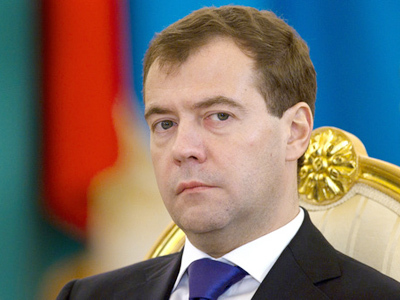 “Have you sorted out things at Domodedovo?” Medvedev asked Chaika, cited Itar-Tass. “The owner seems to be known, but when an inquiry begins – the owner appears to be hidden behind a structure of beneficiaries. 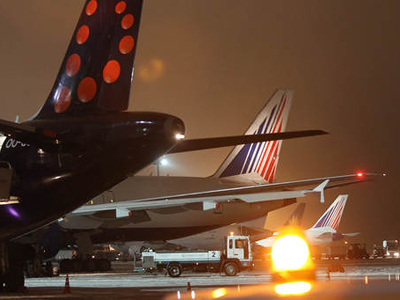 And that the largest transportation hub, where a huge number of planes take off and land!" In response to a question on whether the Prosecutor General has information on the owner, Chaika nodded, but the report itself was read out later, with no journalists present in the room. 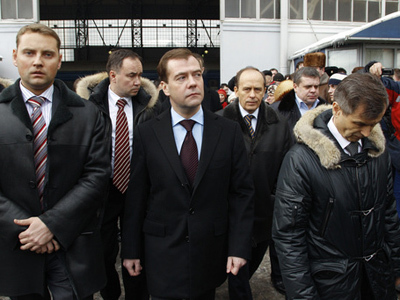 Medvedev also recalled his earlier request to the Prosecutor General's Office for checking on how executive authorities and businesses were following the legislation on eliminating threats to security at the transport facilities. He stressed that not only law enforcement agencies but also state authorities, business entities, and commercial enterprises should be responsible for the facilities they serve “although there is often a desire to wriggle one’s way out”. 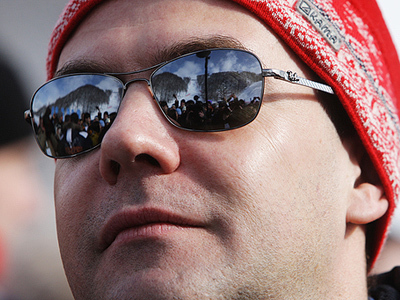 Medvedev emphasized that businesses should be open for dialogue.